Coming to a university from high school can be overwhelming with all of the departments, offices and organizations full of new names. You’ve probably at least heard his name once or twice, but if you need a reminder, Steven Knapp is the University’s president. As part of the 10-year strategic plan, Knapp has prioritized research, affordability and sustainability and supervised the building of the Science and Engineering Hall. A University-wide review is currently being conducted as the Board of Trustees contemplates renewing Knapp’s contract, which is set to expire in 2017. Knapp holds monthly office hours for students. Peter Konwerski’s official title is the vice provost and dean of student affairs, but most students just know him as Peter K. Students are familiar with his Twitter handle, @GWPeterK, which he uses to update students on information from throughout the University or to celebrate students’ successes. Konwerski works with various offices that relate to students’ interests and wellbeing. Rising senior Erika Feinman was elected president of the Student Association in March. They ran a campaign focused on opportunity, affordability and accountability. 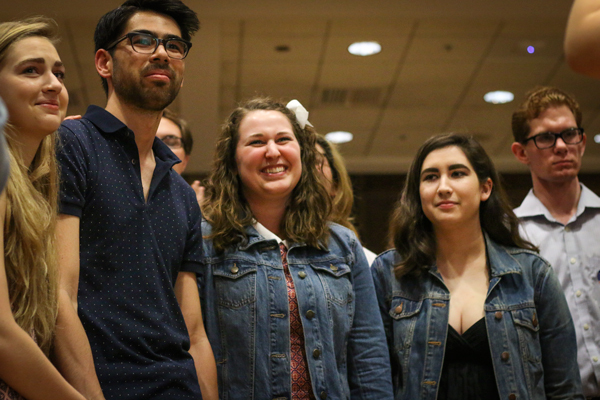 Some of their main goals include adding student representation to the Board of Trustees and putting together a list of off-campus health care providers for students. University Police Department Chief RaShall Brackney leads the University’s police force. Hired last June after previous UPD Chief Kevin Hay retired, Brackney has served as UPD chief for about a year. She recently expressed a goal to improve the atmosphere within the department by offering promotions to officers. Ever since former Provost Steven Lerman officially resigned from the position in January, Forrest Maltzman has served as the interim provost. Since then, Maltzman has reorganized various responsibilities within the provost’s office, including reconstructing the duties of the vice provost for diversity, equity and community engagement. Knapp said officials will begin a search for a new provost after Maltzman has made changes. You can find him at the provost’s office in Rice Hall. Tim Miller is the associate dean of students at the Center for Student Engagement. This means he is involved with student life on campus, including student organizations, like Greek life and GWTRAiLS, as well as residence hall activities. Miller stepped down as SA adviser in 2015, only to begin in the position again in the fall. Miller also has a Twitter handle, @GWTimMiller, where he posts updates about the CSE. You may come in contact with Miller when involved in student organizations.